I first learnt about the woodlands around Fingle Bridge on Dartmoor in Outdoor Photography magazine in their Locations Guide section (one of my favourite features in the magazine). I can't remember which issue it was in, but I do remember seeing the photograph and then putting the location straight onto my custom Google map. This was a couple of years ago and since then I've only been back a couple of times, and generally without much success. I filmed one of my earliest YouTube videos there, so if you want to see how much I've improved my videos you can check that video out here. My original plan for the morning was to head up to the open moorland of Dartmoor and perhaps shoot Great Mis Tor or Great Staple Tor. The problem with that plan was the weather forecast. The morning sky was going to be largely clear with no cloud. Without some interest in the sky, I wasn't sure it would be worth photographing those Dartmoor locations. I wasn't however, going to pass up the opportunity to get out with the camera just because of a clear blue sky. A quick scan of my custom Google map and I remembered all about Fingle Bridge. Perfect I thought! I could shoot the woodlands from the top of the valley for sunrise and then head down into the woodland as it gets lighter. Arriving at Fingle Bridge it was still dark with only a hint of light from the sun. With sunrise still at least an hour away, I put on my head torch and started the walk up the Hunters Path. It was an interesting walk through the dark woodlands. When I pointed my head torch into the woodland I could several pairs of eyes staring back at me. I assumed they were deer and not some sort of wild beast or cat that prowls Dartmoor! As I approached the top of the valley and got above the tree line I could see the valley and woodland stretch out before me. In the distance towards Hunters Tor I thought I could make out some low lying mist. We all know how attracted to mist landscape photographers, and I'm no different, so I decided to go an investigate. Hunter's Tor is at the other end of the valley from Fingle Bridge so it was further than I had planned on walking. I'd given myself plenty of time that morning though so was able to extend my walk without missing sunrise. Arriving at Hunter's Tor I could see a beautiful blanket of mist to the west. There were two small problems though. Firstly, it wasn't covering the woodland, and secondly, it was very thick and you couldn't actually see much of the land below. It was at this point I got a little indecisive. I thought I could hang about Hunter's Tor and wait for it clear a little, or I could head back along the valley and shoot the mist from further away, or revert back to my original plan. I decided to head back along the valley. 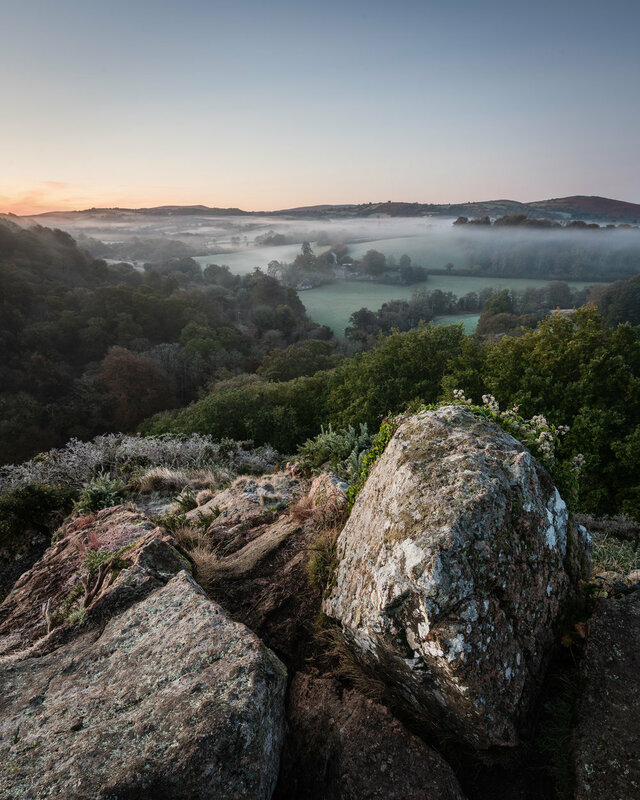 Hunter's Tor on a Frosty Morning, Dartmoor, Devon - Nikon D850, Nikkor 16-35 mm f/4 at 16 mm, f/13, 15 seconds at ISO 64, Lee Filters ND Grad. 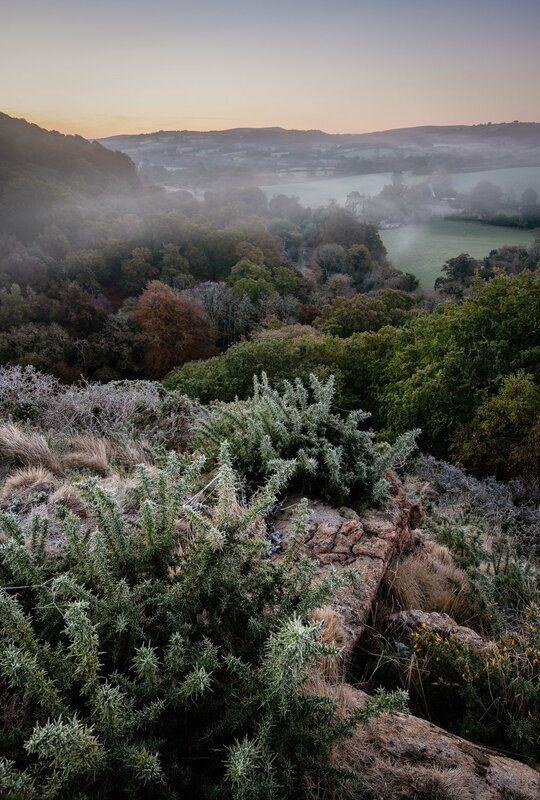 Frosty Fingle, Dartmoor, Devon - Nikon D850, Nikkor 16-35 mm f/4 at 22 mm, f/8, 0.8 seconds at ISO 64, Lee Filters ND Grad, focus stacked image. After capturing those images I decided that I would head back down to Fingle Bridge and maybe capture some shots of the River Teign. As I packed up and started the walk back I bumped into local photographer Neil Porter. I hadn't met Neil before but I was aware of his excellent work and we soon got chatting. Neil offered me a lift back to Fingle Bridge which I gratefully accepted. The heated seats in his car were very welcome after standing on that frosty tor for an hour! Arriving at Fingle Bridge we headed along the river and into the woodland to find the autumnal colours looking glorious. Neil has a lot of experience in shooting this area and he informed me that the colours would get even better over the next week or so. I made a mental note that I would need to come back to Fingle Bridge again very soon. 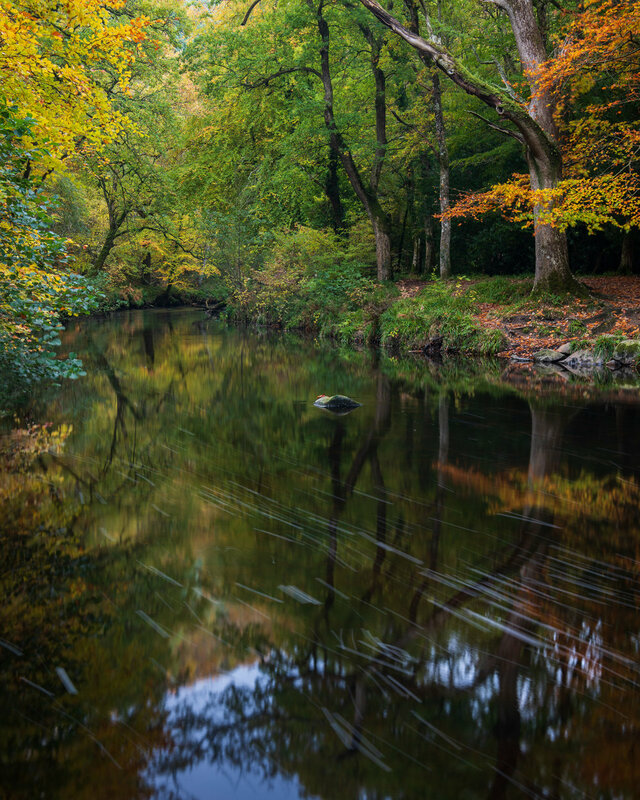 Autumn at the River Teign, Dartmoor, Devon - Nikon D850, Nikkor 24-70 mm f/2.8 VR at 42 mm, f/11, 3 seconds at ISO 64, Lee Filters Circular Polariser and ND Grad. Soon after capturing that image we started to see a few more photographers arrive. Happy with what I got, and with the need to get home, I left Neil and the other photographers to carry on shooting this beautiful autumnal location. I hope you enjoyed the photographs from this location. If you did you might be pleased to know that I also did some filming while I was taking those images. The video from Fingle Bridge will feature in a Dartmoor video that I'm currently producing. I'm not sure when it will be out, but stay tuned to the blog, and be sure to subscribe to my YouTube channel. Have you photographed Fingle Bridge before? What is your favourite autumnal location? Let me know in the comments below.